Many mathematicians and curriculum bodies have argued in favour of the theory of formal discipline: that studying advanced mathematics develops one’s ability to reason logically. 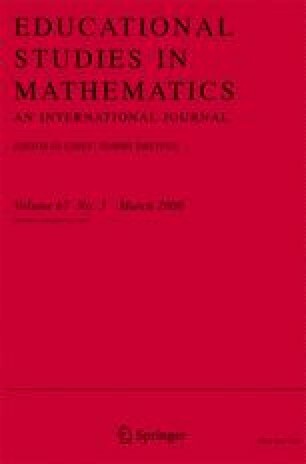 In this paper we explore this view by directly comparing the inferences drawn from abstract conditional statements by advanced mathematics students and well-educated arts students. The mathematics students in the study were found to endorse fewer invalid conditional inferences than the arts students, but they did not endorse significantly more valid inferences. We establish that both groups tended to endorse more inferences which led to negated conclusions than inferences which led to affirmative conclusions (a phenomenon known as the negative conclusion effect). In contrast, however, we demonstrate that, unlike the arts students, the mathematics students did not exhibit the affirmative premise effect: the tendency to endorse more inferences with affirmative premises than with negated premises. We speculate that this latter result may be due to an increased ability for successful mathematics students to be able to ‘see through’ opaque representations. Overall, our data are consistent with a version of the formal discipline view. However, there are important caveats; in particular, we demonstrate that there is no simplistic relationship between the study of advanced mathematics and conditional inference behaviour. We would like to thank Gary Davis, Paola Iannone and Keith Weber for their helpful comments on earlier drafts of this work. QAA (2002). Mathematics, statistics and operational research subject benchmark standards. Online article [accessed 15/07/2005]: http://www.qaa.ac.uk/academicinfrastructure/benchmark/honours/mathematics.pdf.